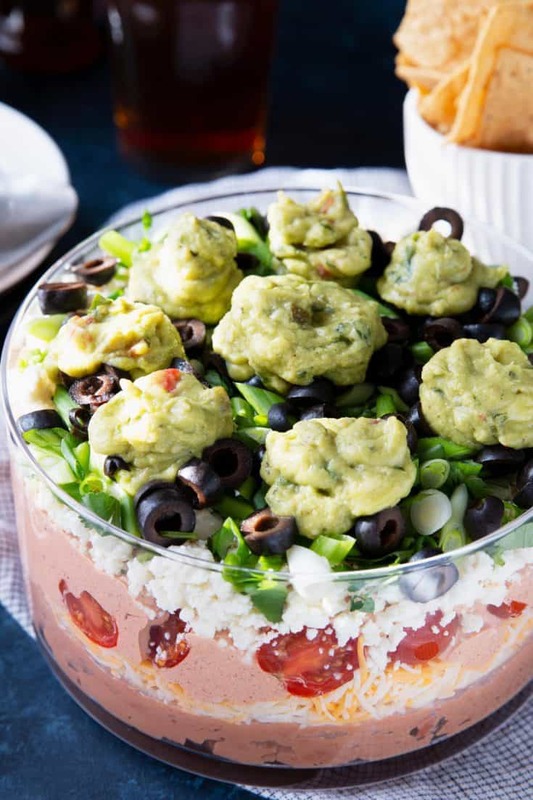 This easy 7-layer bean dip recipe is perfect vegetarian appetizer for football season. Serve it with tortilla chips! I am always on the lookout for vegetarian appetizers for my non-meat eating friends. My 7-layer bean dip recipe omits ground meat like beef or turkey and instead uses just refried beans for protein. It is always a hit with my vegetarian and meat-loving friends which makes it the perfect party addition. 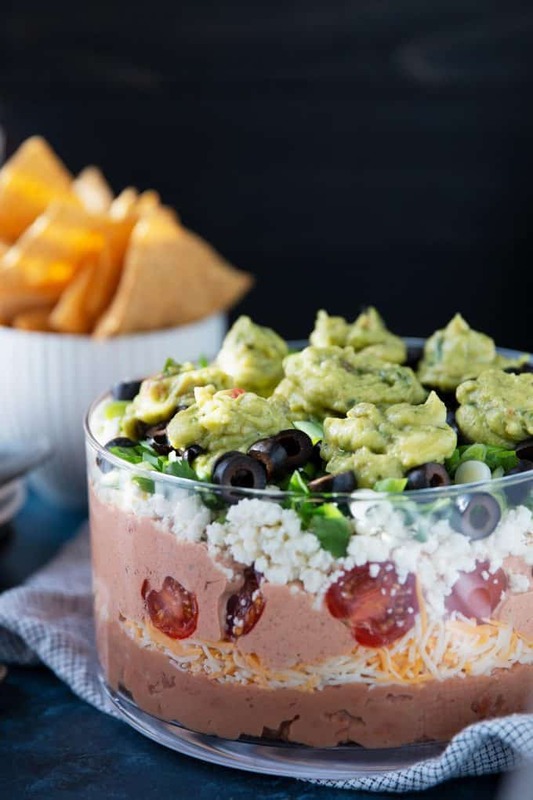 This Mexican bean dip is the ultimate party food. It’s simple and easy to make and I daresay it is the best layered bean dip recipe out there. Start by combining the cream cheese, sour cream, and taco seasoning. I use a homemade taco seasoning but you can buy a packet of it at the store. You can use a sturdy spoon or a hand mixer to do this. Then combine the green onion, cilantro, and black olives. Many people don’t like cilantro or black olives – feel free to omit either. 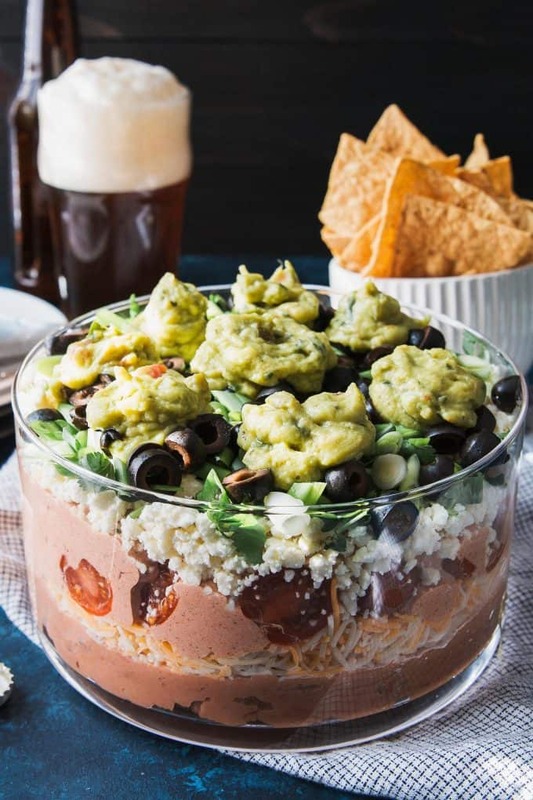 What order does the 7-layer bean dip go? 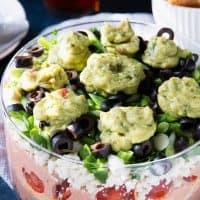 What type of dish should I use to serve a layered bean dip? For my photos, I used a deep dish like a trifle bowl. 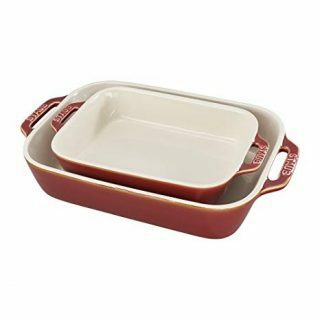 Shallow casserole dishes are also a great option. 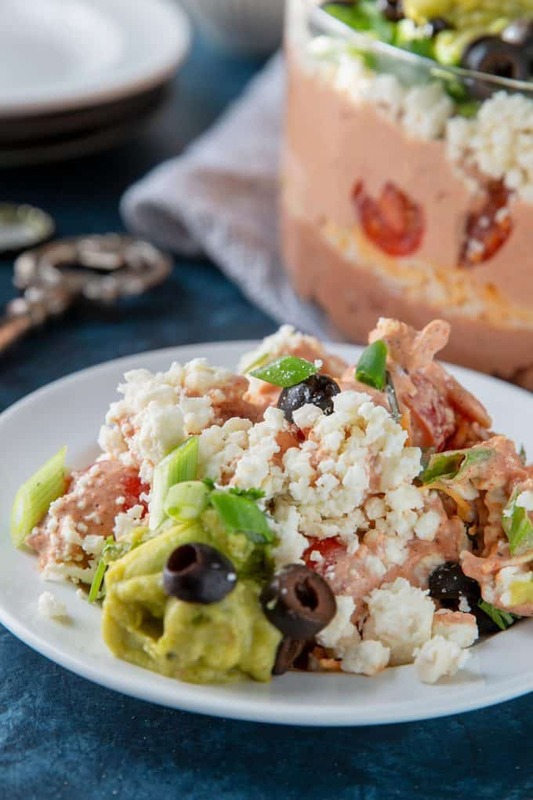 Do you heat this 7-layer bean dip recipe? Personally, I like to serve this dip cold. 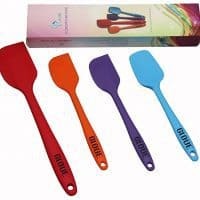 Not only does that save you more time, it also allows you to prepare it ahead of time. If you do decide to serve it warm, make sure to use a casserole dish that is oven-safe. Heat the beans and shredded cheese in the dish and then proceed to assembling the layers. 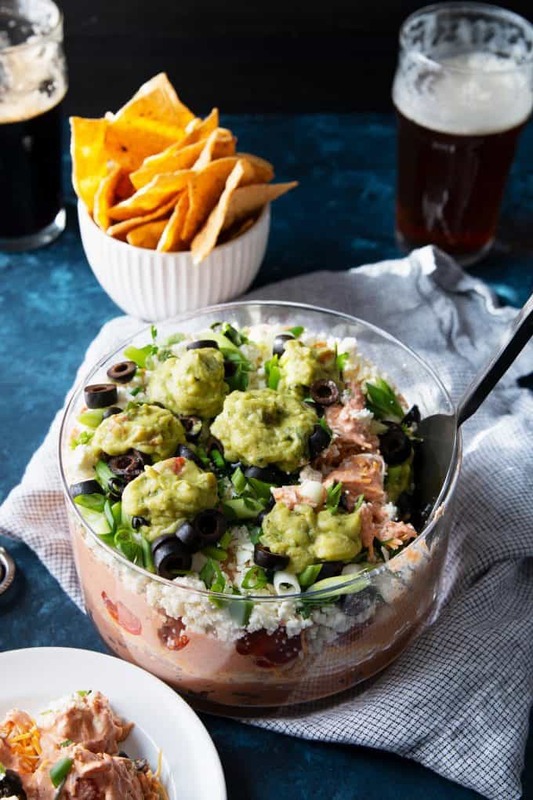 Looking for more recipes to add to your super bowl spread? Try these! In a medium sized bowl, combine the cream cheese, sour cream, and taco seasoning. Set aside. In a small bowl, combine the green onions, cilantro and black olives. Set aside. Begin layering the dip in your serving dish. Smooth the refried beans on the bottom using a spatula. Top that with the shredded cheese, the cream cheese mixture, the tomatoes, cotija cheese, the green onion mixture, and the guacamole. Arrange the layers in whatever order you wish. This data was provided and calculated by Nutritionix on 1/20/2019.